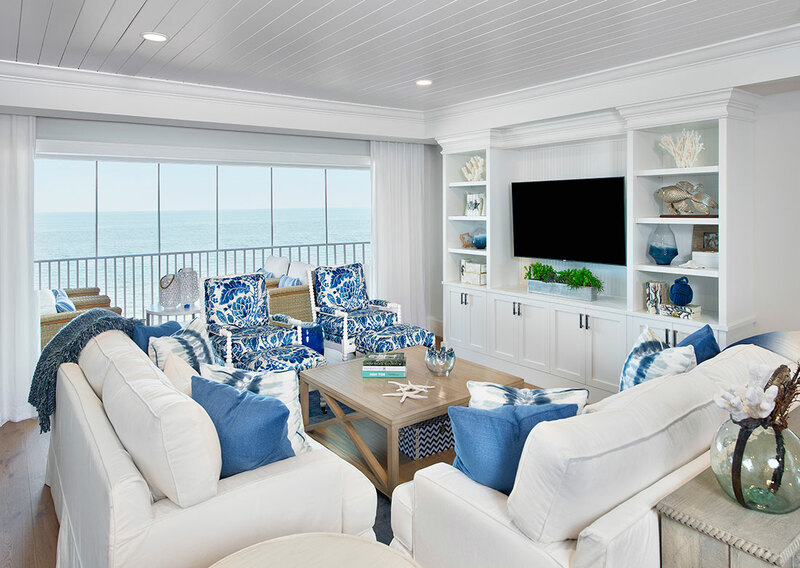 An easy, relaxed interior scheme begins in the living room, where Richardson chose sofas slipcovered in white washable linen topped with pillows that mix Manual Canovas’ bright-blue textured fabric with Kravet’s bold tie-dye accents. Vanguard Furniture’s cocktail table mimics the driftwood finish of Legno Bastone’s wide-plank, white oak from Naples Flooring. 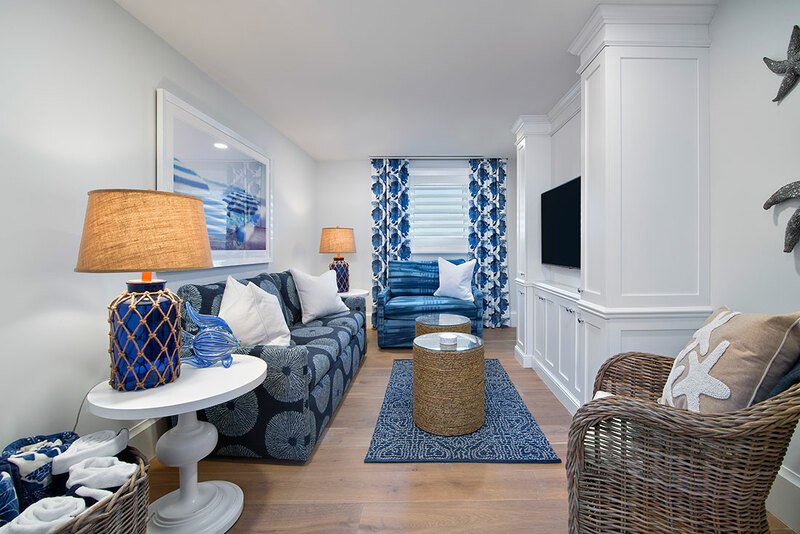 The CR Laine ottomans are clad in Kravet’s batik island print, while Hadinger’s over-dyed indigo, hand-knotted wool area rug anchors the beachy chic space. 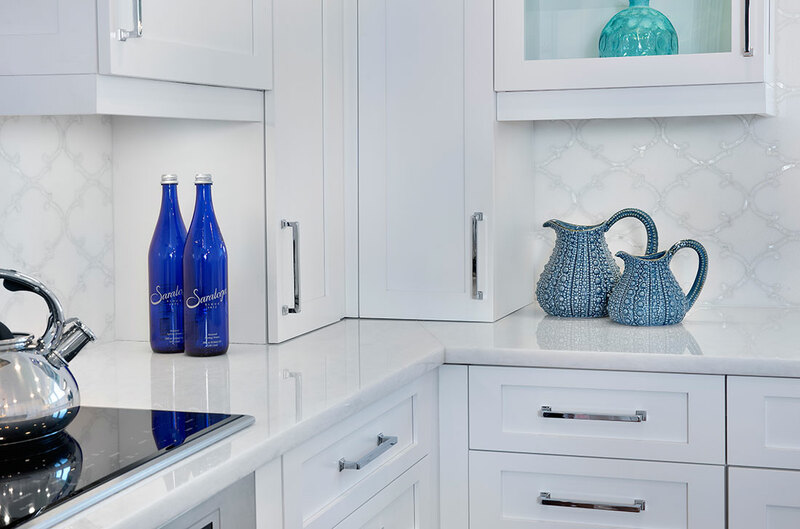 In the kitchen, glass art provides oceanic pops of color. 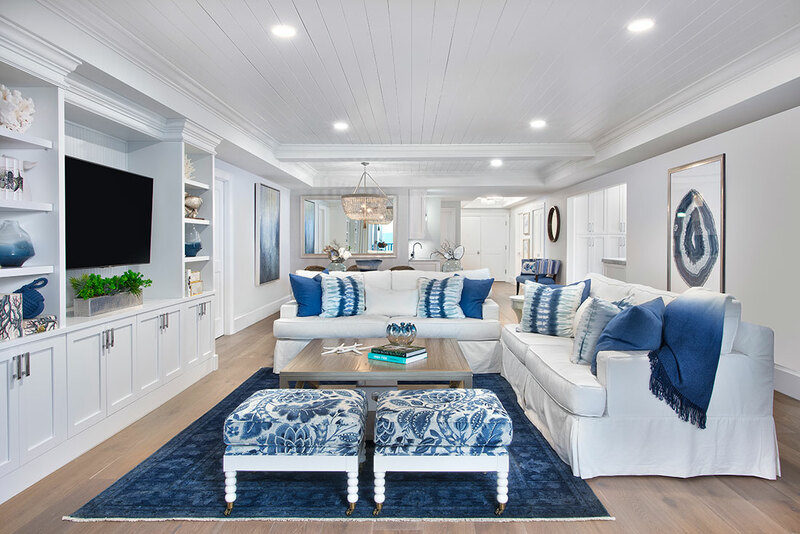 Noir counter stools seated in burlap tuck neatly beneath the center island topped in UMI’s leathered blue calcite. Visual comfort’s simple lanterns keep the space open. 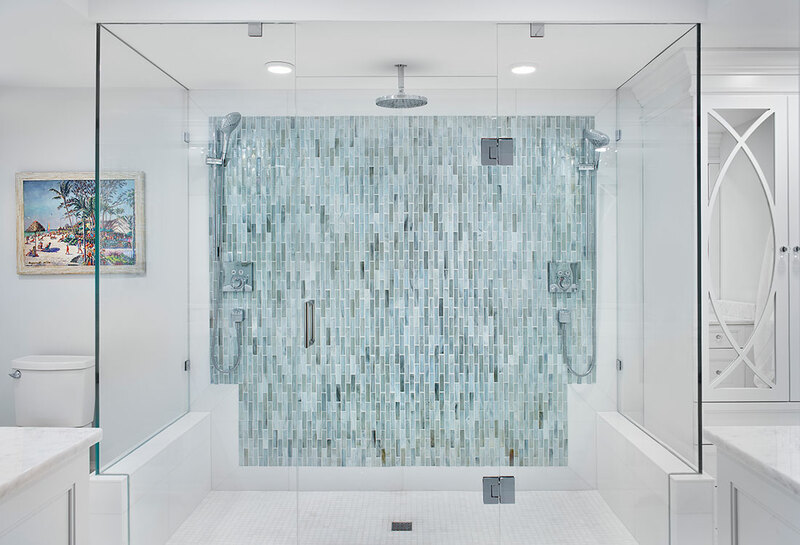 For a touch of elegance, Richardson chose arabesque white thassos marble tiles accented with mother-of-pearl to style the backsplash. 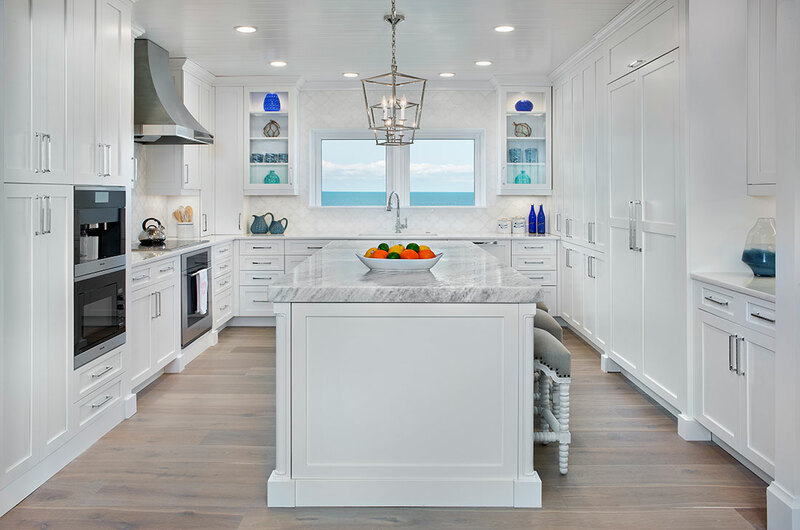 “The island countertop is a leathered blue calcite that recalls the water and the waves,” the designer says. 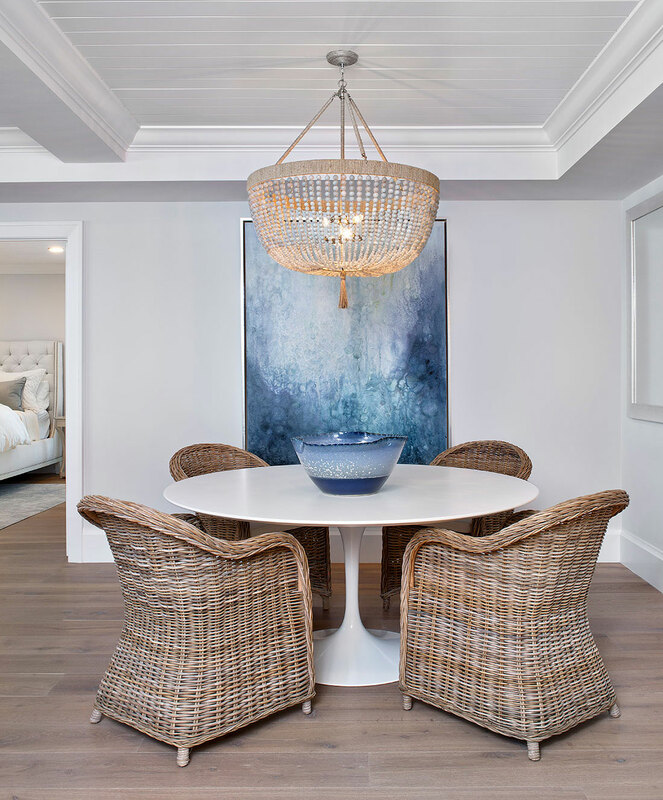 Strings of cloud-jade beads style a Ro Sham Beaux raffia-wrapped chandelier that shimmers above the casual dining area. 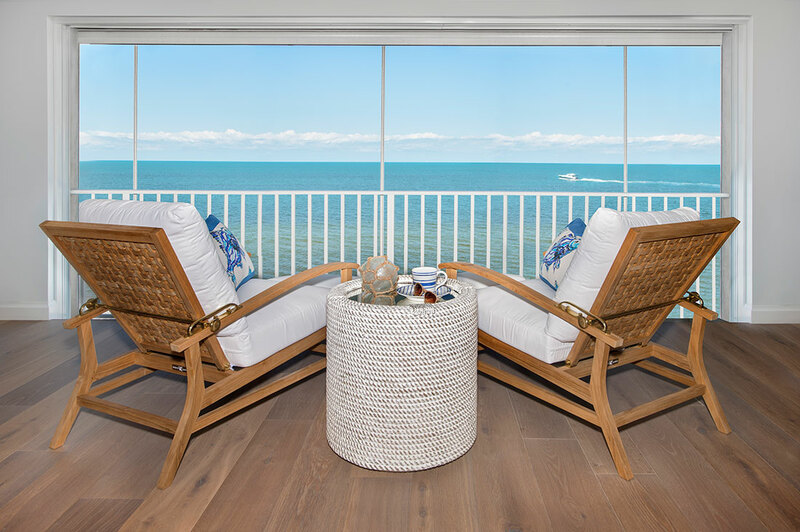 Here, woven rattan “Riviera” chairs by Phillips Scott circle Eero Saarinen’s “Tulip” table from Knoll. 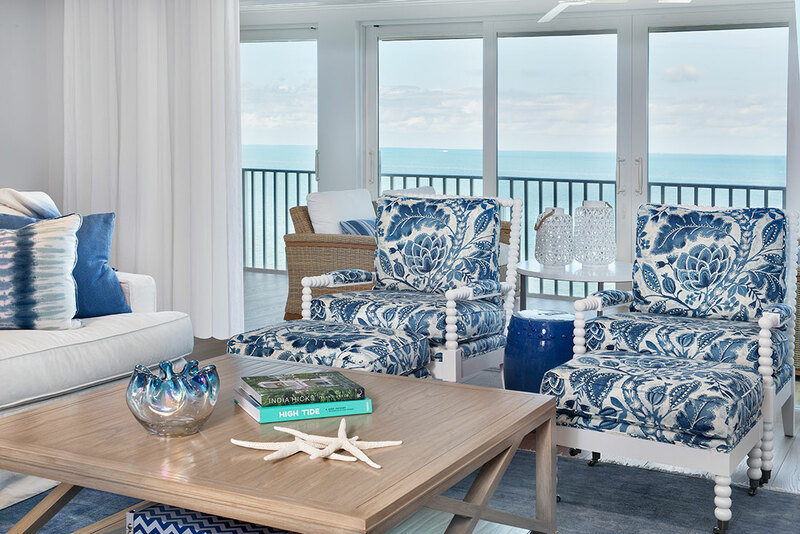 A John-Richards multi-blue, glazed centerpiece bowl and the large, mixed-media abstract by local artist Anna Rac mirror the colors of the Gulf of Mexico. 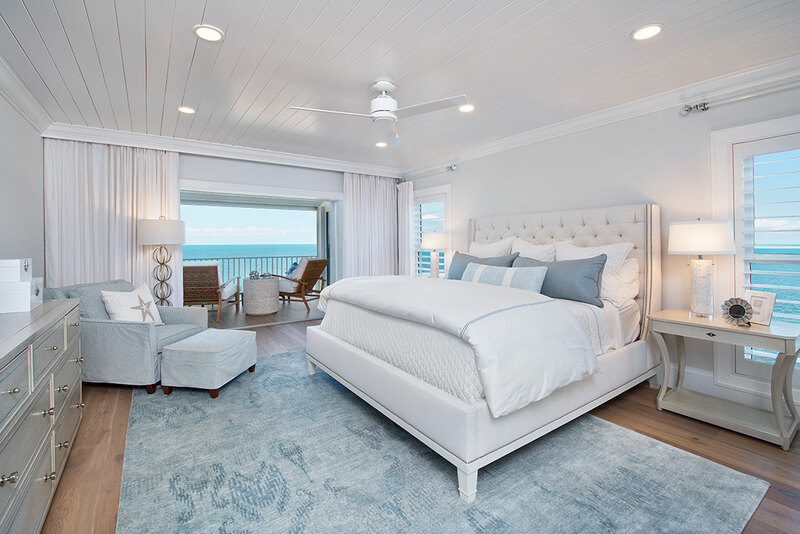 A retreat bathed in blue and white, the tufted, textured-linen upholstered bed is dressed in cool white linens. “We wanted soft and washable, perfect to climb into after a day at the beach,” Richardson says. 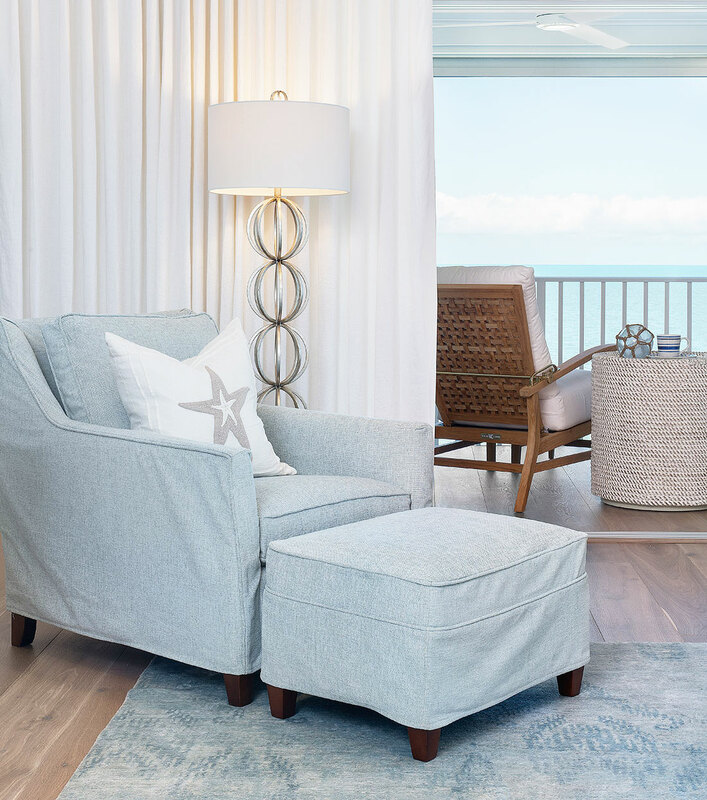 A deep-seated lounge chair and ottoman, slipcovered in a soft blue-gray blend, and the “Mariana” floor lamp styled with stacked silver spheres tuck casually into a corner sitting area. 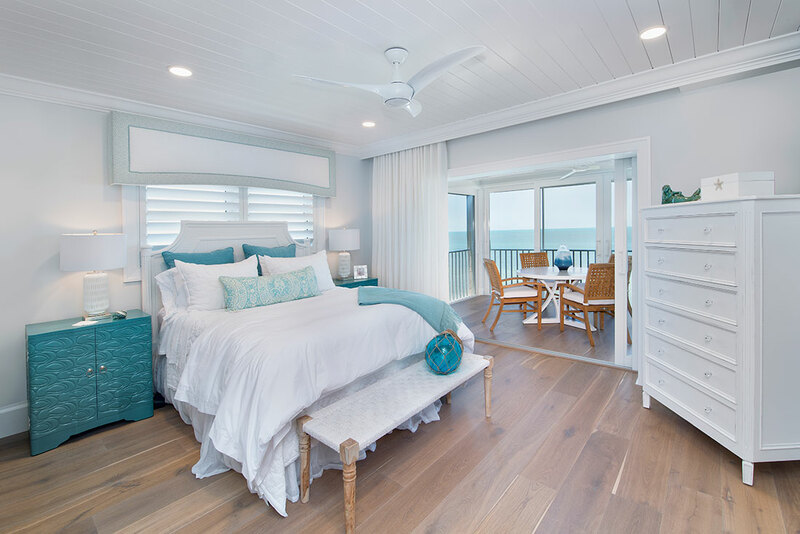 A hand-carved mermaid presides over a full balcony. 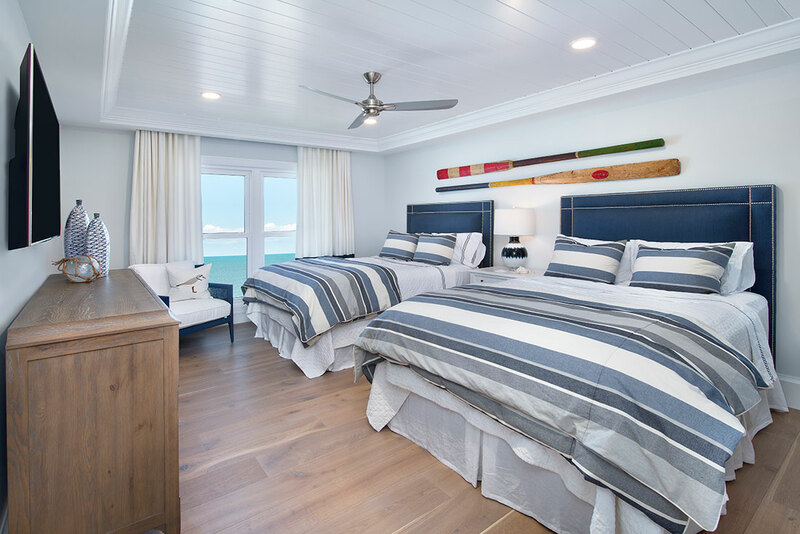 “Strategically placed seating allows the family to watch sunsets, passing sail boats and the occasional manatee,” Richardson says. Modern in Spirit. Always Timeless.